Hundreds of communities are working to restore their waterways and, in so doing, advance community and economic revitalization. The U.S. EPA has partnered up with two organizations, Groundwork USA and River Network, to establish the Urban Waters Learning Network to create and promote networking, provide technical assistance and learning opportunities to over 350 organizations all over the country. The Urban Waters Federal Partnership aims to stimulate regional and local economies, create local jobs, improve quality of life, and protect Americans' health by revitalizing urban waterways in under-served communities across the country. Click on the map to get information about existing Urban Waters projects. 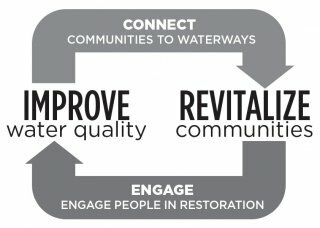 Urban Waters work supports a positive cycle that begins with connection to water, which builds community engagement, leading to water quality improvement and revitalization. Learn more.